September 15, 2008 Mike Zint been busy on his Dolphin search and has now saved his own Dolphin! A special one. He sent in the following email and "before" photos - soon to be replaced by "after" photos. Congratulations! It seems like this summer has been Dolphin Of The Month; in July I brought Feather #104 to the team, In August it was Vicky Brewer's New Mexico boat Hull # 196. Now for September I bring the best surprise of all! With apologies to Loki #277 whose story of "The Last Dolphin" we've all enjoyed and to Fire Escape, last on the registry at #299, I bring to the Dolphin Team Hull #300! 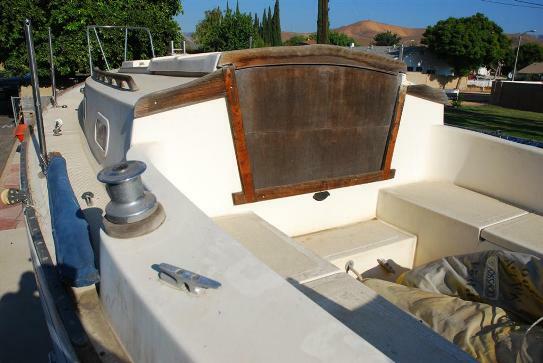 I've just purchased this boat in Simi Valley California and trailored it home to Phoenix, Arizona for restoration. My daughter Hannah has chosen a most appropriate name for what is now truly the last Dolphin; Grand Finale. I've sent you separately, pictures of the builders plaque and a previous registration showing the complete HIN as would be on the transom. It appears as if the rear of the boat was damaged at some time and repair to the area filled in the HIN. 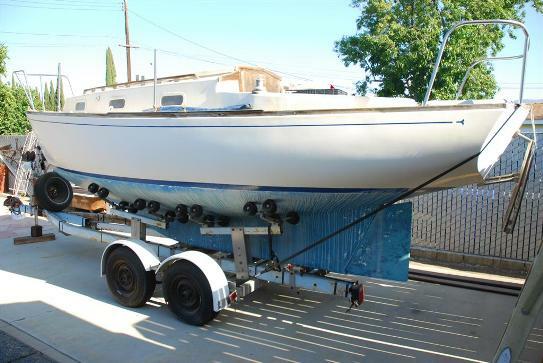 In tracing the history of the boat, here is what I know so far: the owner registered the trailer in 1984 in Simi Valley, CA. The boat was registered to the same owner in Idaho in 1996 and in a slip in Bayview, Idaho, paid for thru 6/98. 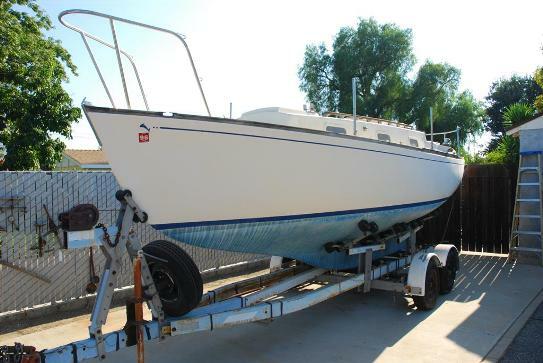 The owner was back in Simi Valley, CA from 2001 thru 2004, at which time I assume he died and the boat fell into dis-use and the family gave it away to the person I got it from. He had given up on restoring the boat and was going to dig a hole and bury the boat if it did not sell. I am going to try to track down the record information I received with the boat and try to discover the boat's original name. Mike advises that Grand Finale has an EZ Loader Roller Bunk trailer. 5890# capacity, tandem axels with drum surge brakes on the front axle. What's that's photo on the bulkhead? September 19, 2008 - Mike is working on his boat and sent in the following email and photographic evidence. I have a new favorite pastime.....polishing Grand Finale. The bootstripe to the toe rail is done and looks very good. The bootstripe is nice and shiny and all the staining and chalkiness is off the hull. But this was the easy part, right? Next is clean out the interior and see what we've got. 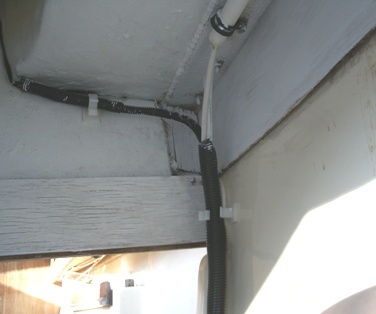 There's a cockpit mounted manual bilge pump, a blower set up to vent the lazerette and fittings for the roller furling line mounted on the port topside. Unfortunately someone else must have the roller furling because it didn't come with the boat. Tomorrow I deal with the registration at the Game and Fish Department. They were nice over the phone 2 weeks ago, but I'm worried about the covered up HIN on the transom. 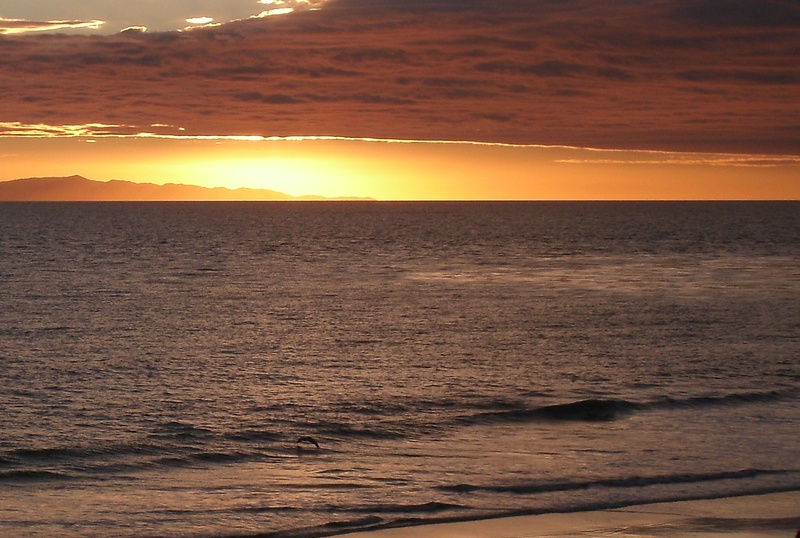 Both Erik (Robin) and Doug (Aspara) are up for my idea of a Dolphin rendezvous at Catalina Island next fall. 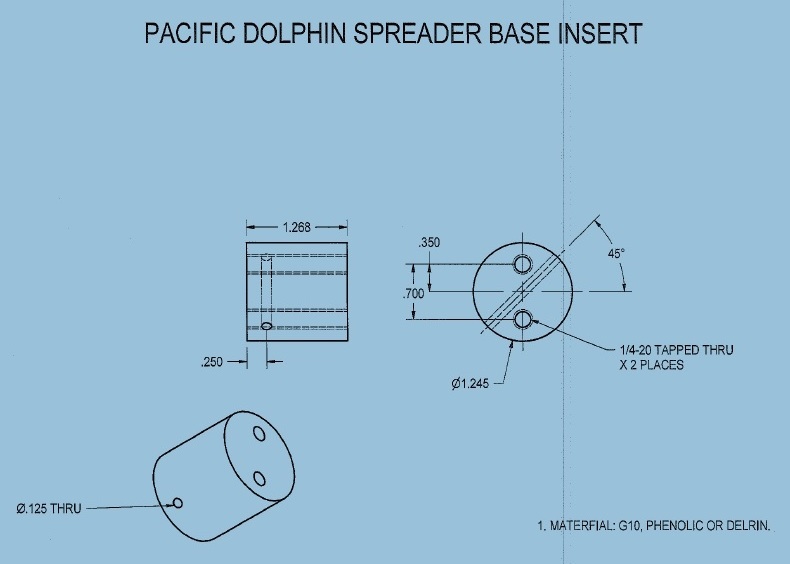 It'll be interesting to see how many Dolphins we can get to participate. Why should you East Coast boys have all the fun? It'll cost me a nice Bed & Breakfast for the Admiral, but it'll be worth it. I've got the v-berth area cleaned up today, the old cushions stored away in the shed, the miscellaneous items boxed up and stored away also and sanded some spots on the bulkheads to see if they'd clean up. They will and look great, all the black mold and water stains come out. It appears the bulkheads are teak also.I thought they might be mahogany, but they have the same texture, color and grain as the teak trim pieces. I also measured the teak trim on the outside of the hatchway and bought a new teak board to make replacements as most of these trim pieces are damaged. Teak is on sale here this week, $29.99/ brd ft. So 1 board, 7" x 72 x 3/4" was $111. I've decided the hatch boards will come out of something else. I still need to get a board to fabricate a new arch piece to replace the cracked one where the builders plate is, but that will come after the first of the year. I've added the missing mainsheet traveler to my shopping list of things to buy. Rigging won't come until the spring but it's fun to spec things out. Batteries and a new electrical panel are on the list also. 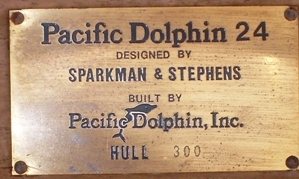 I hate to have to replace the one that says "Pacific Dolphin", but it was under water and I don't trust it. 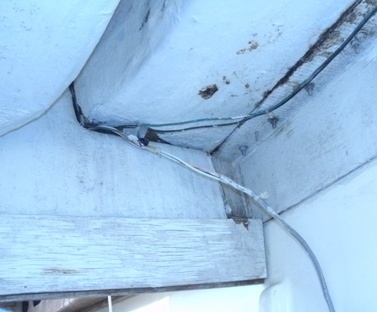 Once the boat is completely cleaned out, I'll replace all the wiring, that way I know I have no problems. Still to do is un-coil all the standing rigging and see what I'm missing there. Finally gotten to boat repair weather here in Arizona. I thought Grand Finale was in bad shape when I got her, but looking at the pictures today of Dorado makes me thankful for dry west coast weather. 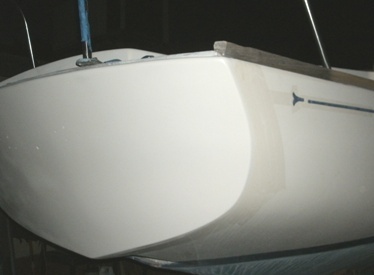 I ordered GelCoat this weekend from JDI (oyster white) so I can patch up the transom and repair the mast step. Next are masthead sheaves and the goosneck. Sheaves will come from Catalina Direct and the Gooseneck from Dwyer Mast. I'll document the process for the Technical Section. I'm in serious "do what it takes to just get the boat in the water" mode. The rest of the restoration is going to take many sailing seasons to accomplish. Gee...who did I hear that advice from last year? I've got a springy section on the foredeck that I think is delamination of the core - an 18" diameter area in front of the hatch. I need to stand on another Pacific deck to calibrate to what's normal. Looks like the best repair technique is to come from underneath. Definitely a next year's project though. December 13, 2010. Mike sent in an update and photo on his project to replace Grand Finale's subfloor. The weather was soooo bad here today. Bright sunshine, 78 degrees, not a snow cloud in sight! So I took out the rotten subfloor from Grand Finale and made a new one. I used 19/32nd exterior plywood. You can get 2 from one 4x8 sheet. I'll clean out the bilge next weekend and install. Haven't decided what to top it with yet, I'm thinking light Brazilian Cherry hardwood. March 13, 2012. 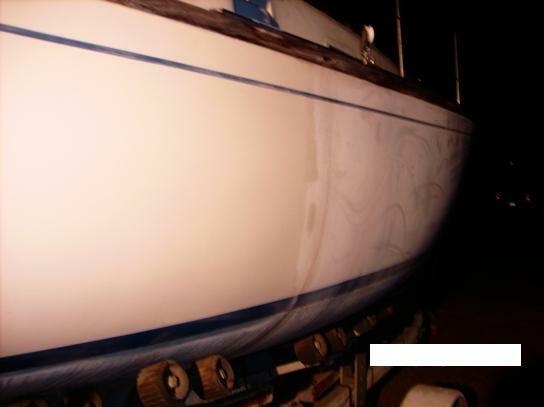 Update from Mike - re transom and transom deck repairs (minor edits). We have this progress report in our Technical/Miscellaneous Section as well. 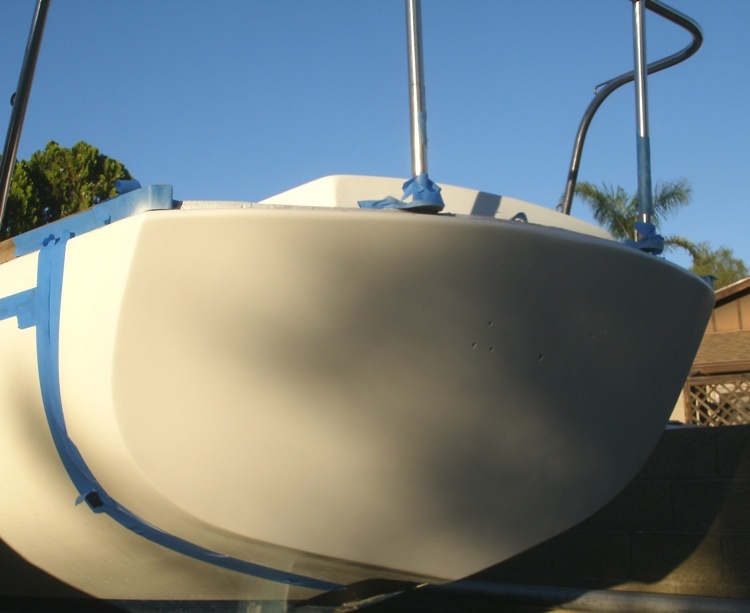 It was a very nice weekend for working on the boat here in Arizona, the weather has gotten nice enough to start thinking about re-gelcoating the transom. This was required in order to fix the sanded through area required by the State Game and Fish Department to look for the missing HIN when I had applied for a title to the boat. 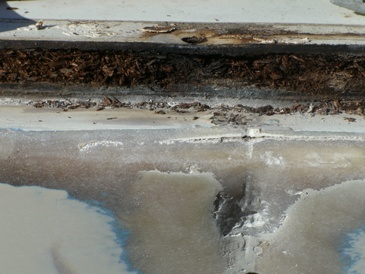 Blending the edges fair revealed an undiscovered void in the top center of the transom edge. Removing the cobbled together rear toe rail (or whatever the technical term is for the piece of teak on the transom) revealed a wet and disintegrated core in the aft 4-8" of deck. Looks like it was originally 3/8" plywood. All the defective material has been dug out and after the area dries out a bit, I'll pack it with epoxy and new marine plywood. After the fiberglass and gelcoat repairs are done on the transom, I'll make a new toe rail piece but it won't be out of teak. 8/4 teak is on sale this month for $30 bd/ft, so only $240 for 1 board. Not sure I can sell that at home! African mahogany is on sale for $7 bd/ft, so $55 seems like a much better choice. The hardest part of this so far was removing all the extra long through bolts on the push pulpit and chocks. Removing the rear hatch completely then having a tall young helper with long arms stand up though the motor well from underneath is the best way to do this task. Ps a March 17, 2012 follow up - I've always wondered about the build conditions of Grand Finale as it was the last boat out the door. Did the workers put extra care, or was it "git it done and we're out of here"...So far it looks like the workmanship was ok, but some of the materials were short changed. The transom rail was cobbled together with 8 pieces of teak, the main arch is a scarfed together piece. Tonight I looked between the layers of the decking with a flashlight and came to the realization that the deck is cored with particle board. All I'm finding is nothing but flakes of wood, even down to the dry part. I'm up under the deck about 10 inches on the starboard side, and 4 inches deep across the center, up the the hatch edge. I think the plan at this time is to pull out as much core as I can reach, even the dry part and replace it with epoxy and plywood. When I pull the toe rails, I'll have to do the same process down each side. November 30, 2012. Mike has also been thinking about his worn out main sail. We have included his comments in our Technical Section/Sails. Click here to go there. Finally getting time to work on my boat. New surge brake actuator mounted, front half of trailer repainted. I need to move out to driveway and raise the trailer higher to finish painting the rear half. Of course it might be a lot easier if I could just get the boat in the water and off the trailer for a few days!! 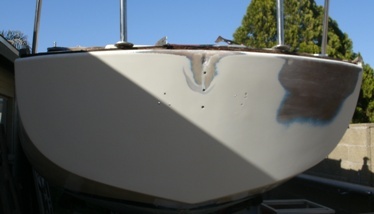 On fairing layer of transom fiberglass repair, gelcoat next, then insert new core and epoxy into rear deck area. Chased down the rotten deck core this weekend . picked at it untill I had all the loose stuff out, about 12" up inside the deck from the transom. 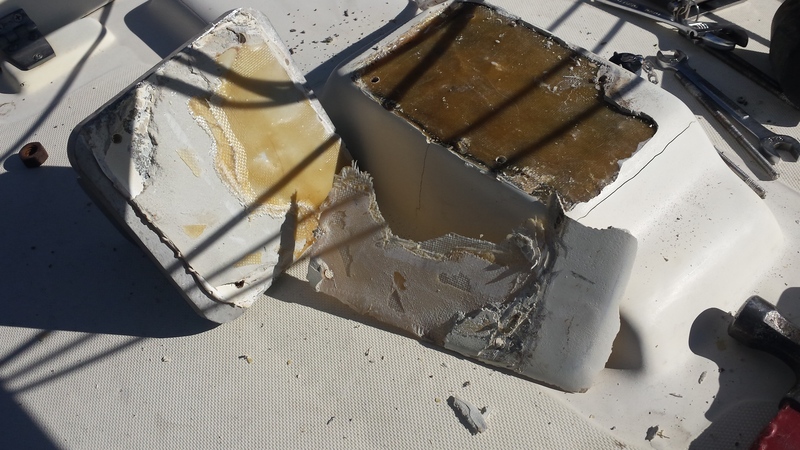 Felt around the starboard cowl vent and noticed there might be more crumbly core. 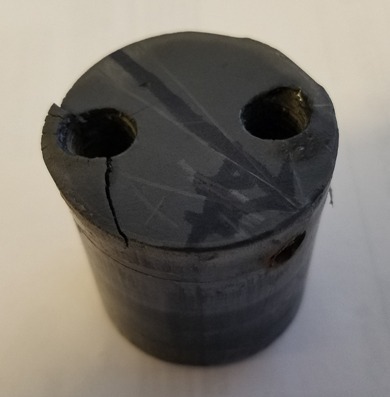 Removed cowl vent and discovered that it was never sealed or bedded, and the core was bad all around it, More poking and digging with the Dolphin Core Removal Tool, a sharpened 3/8" dowel, and I was now 18" deep inside the deck. 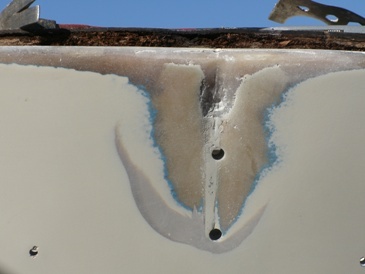 Removal of the port cowl vent revealed only about an 1nch or so of rotten core around the vent . In case anyone wonders,there are 3" wide strips of 5/8 ( now 17/32") plywood under the raised non-skid areas and 1/2 ( now 15/32"_ plywood across the transom. All now epoxied in place. Will trim, seal and fill any gaps then install new cowl vents. Weather finally got nice enough to spray gel coat late yesterday and still had to catalyze at just barely over ½% to keep from setting up too fast. Good color match, dark around the sides is from the tape and will buff out. It’s pretty! I had a couple of months of avoidance/fear factor too. I kept putting it off just because I’d never sprayed a catalyzed product and sifting through all the instructions in my books, and on line, revealed gaps of information to what I felt were key points in the process. First attempt Sunday morning at 6am resulted in only ½ of the transom getting coated as I had mixed at 1 ½% and the gel coat started setting up in the sprayer. I used the Preval disposable sprayers ( now available at Home Depot ) which were another new factor in the equation. I’ll sand and de-wax tonight and spray another coat this evening. Since I purchased the colored gel coat from Jamestown (Distributors) which is a finishing gel coat, I need to let it cure and sand between coats. How many layers of waxed gel coat I could spray in one session was one of the factors I could never deduce, so I’m taking the cautious route. Lazerette vent holes are sealed, the vents repainted inside and re-installed, new yellow tail blower mounted and wired up, new wire run for the stern and mast light. 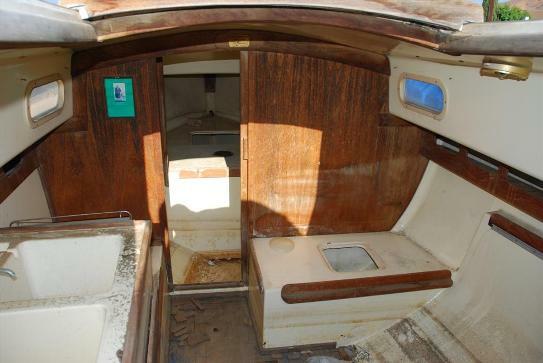 I got chastised by my brother this week for not “just buying a boat in sailable condition”. How do you explain that once you’re smitten by a particular boat, all the work becomes just a labor of love. Weather is great here in Arizona and I’m starting to make really good progress on my projects. Transom is gelcoated and curing before sanding and polishing out, quarter berth areas are cleaned out, raw fiberglass has a fresh coat of paint, wiring is all run, switch panel is rebuilt, 12volt socket installed and now the mast tabernacle has been cut open to evaluate the large cracks. I looked at the color match on the first coat (picture Oct 3 above) and decided to tweek the color a bit. 5 drops of brown and 3 drops of yellow per 4 oz to JDI’s Oyster White Gel Coat. We have LIGHTS!! New group 24 battery installed last night and navigation and interior lights hooked up. Both side lights are white though, so I’ll have to hunt down the colored lenses for them. Making progress! 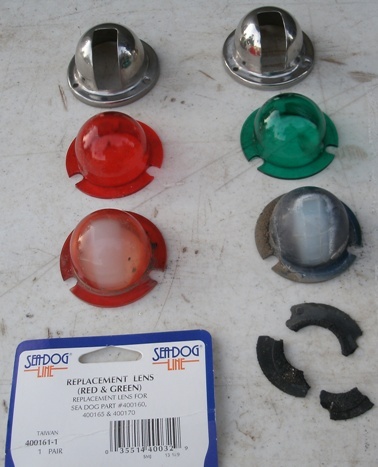 New navigation light lenses and new white/red LED cabin light should be here today or tomorrow. Fitting in subfloor tonight. With the mast tabernacle torn apart, I think I’m just about at the end of the taking apart stage (except for the sideways mounted cockpit bilge pump and the sink water pump and lines), and well into the reconstruction stage. Great sale at West Marine this weekend, 50% off on many things including foul weather gear….may just have to buy my own Christmas presents! November 26, 2013. 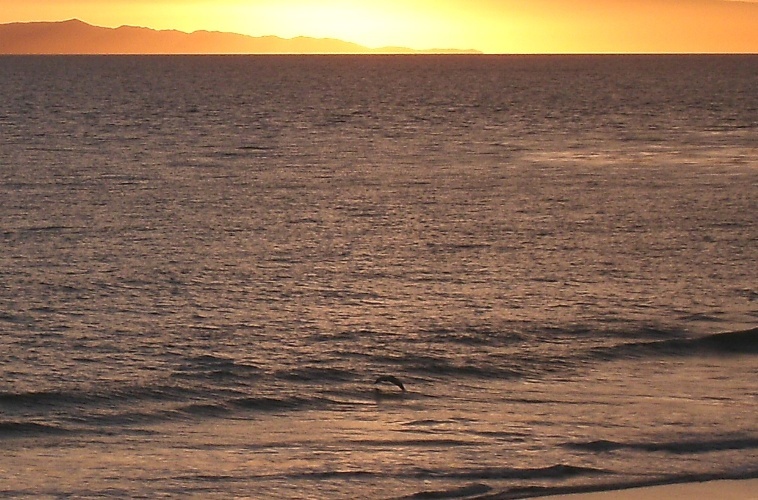 Southern Californian Dolphinites are regular visitors to the Channel Islands lying off the southern Californian coast. 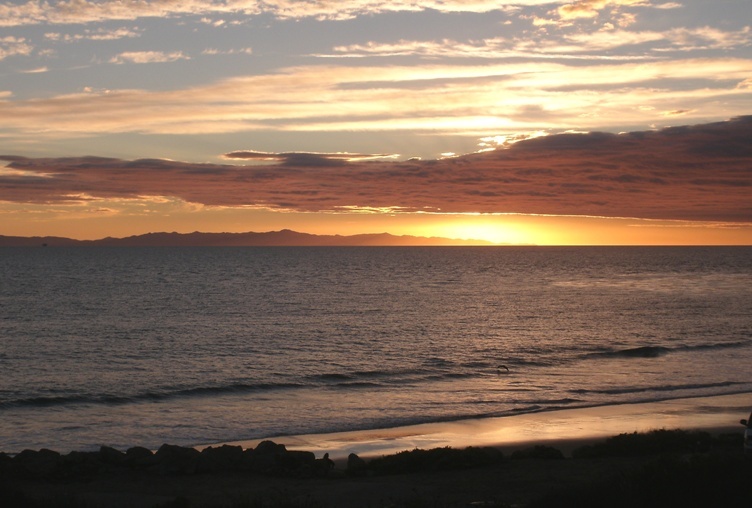 Type in Channel Islands in the search engine (box upper left) and see a listing of reports. Mike Zint and daughter Hannah are making plans to get Grand Finale there (minor edits) and sent in a couple of beautiful pictures (look close!). Click here to go to Wikipedia's description of the islands. Click the back arrow on your browser to get back here. December 2, 2013. Ok, back to work. Mike has a short report on his navigation lenses. Had a chance to install the new lens for my navigation lights this weekend. Old ones were sun faded and the color had washed out. 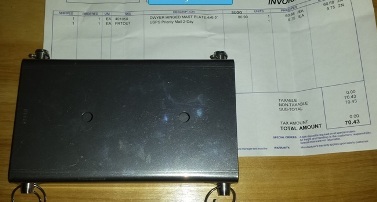 New ones were about $6.00 from Defender. Polished out gelcoat on transom this weekend, still need an additional coat on the mast step; main hatchway trim cut and stained, cubby trim cut out and routed, new drop boards cut; new lens for masthead light on order, new led bulb for masthead light on order. Things starting to move along. Woodworkers Source had Mahagony on sale for $7.49 bd/ft so I scooped up a few boards to remake all my cockpit trim. Photos next week. On track to raise the mast on Memorial Day weekend. Then trailer tires, install the new trailer wiring harness and brake lines and we're off to the lake! Grand Finale is coming along. New trim along hatchway is finished up, new stern light installed and wired up ( just have to stand on my head and tack the wiring up under the gunnel)l. Masthead crane rebuild is next up. Ream holes and install new sheaves and clevis pins is on the agenda. Sheaves came from Catalina Direct (C-25) and clevis pins from Grainger's. I'll send photos of this as I do it to share. Aft of boat is in re-assembly mode. I had to clean out and fill the pushpit mounting holes in the deck with epoxy ( soft deck core around holes) and after I finish up the stern light wiring, I'll add the name, re-install the pushpit, boarding ladder and mooring cleats. Postscript: May 19, 2016. I'm still too busy working on other peoples projects to do my own. 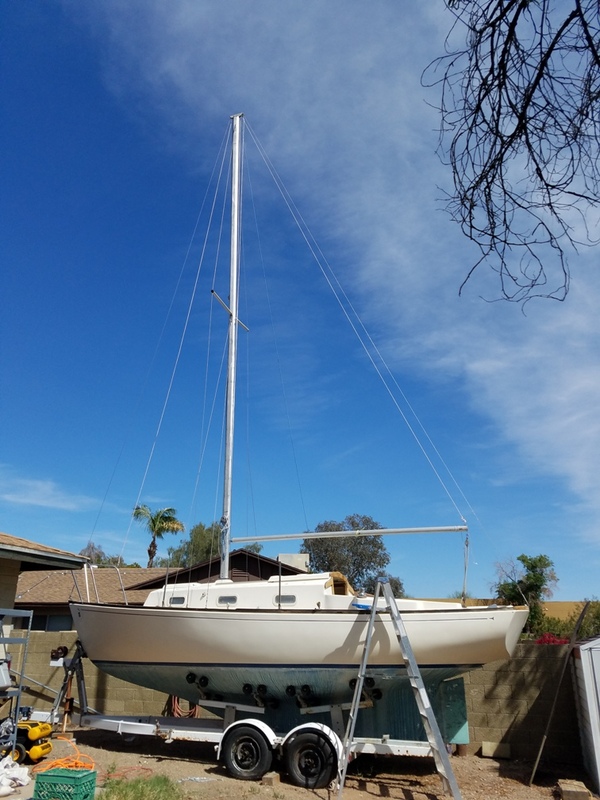 I just need to fair, then gelcoat the mast tabernacle hump on the cabin top, then I can remount hardware and raise my mast to do the measurements for my new mainsail from Precision. Would be interesting to get all the boats with new mainsails together and compare . Unfortunately, I haven't been able to touch Grand Finale at all this summer. But the weather is starting to break here so that will open up more time for boat work. The hurricane from Mexico blows through this week and should put an end to the summer heat wave. Went searching for the capsize ratio this weekend and found the Good Old Boat review in the web site (http://www.dolphin24.org/goodoldboat6pages.pdf). As I read the line in the story "What should you do if a certain 24 foot hull in the boatyard turns your head?" I can still remember the moment I saw Feather up on stands in the boat yard in Santa Barbara and was smitten. September 13, 2016 Mike reports on a spreader problem. 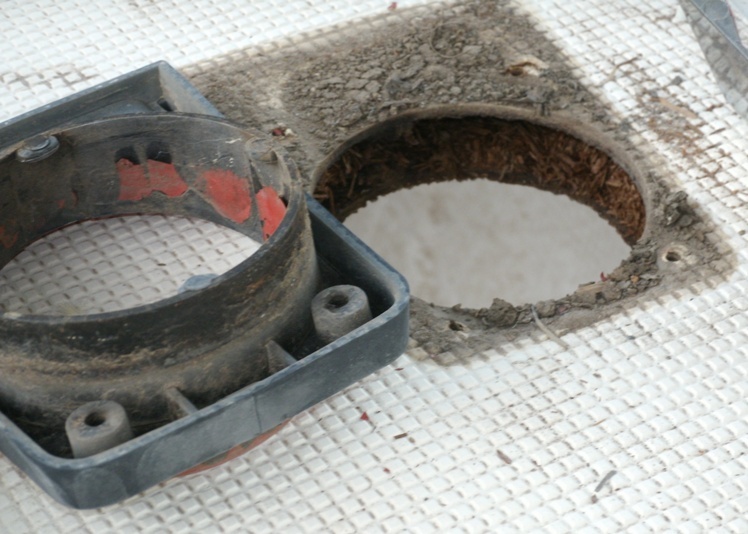 We have it here and in the Technical Section/Spars/Spreader brackets.. Click here to go there. I almost got the mast raised for the first time yesterday, but the port side spreader wouldn't stay attached to the mast. 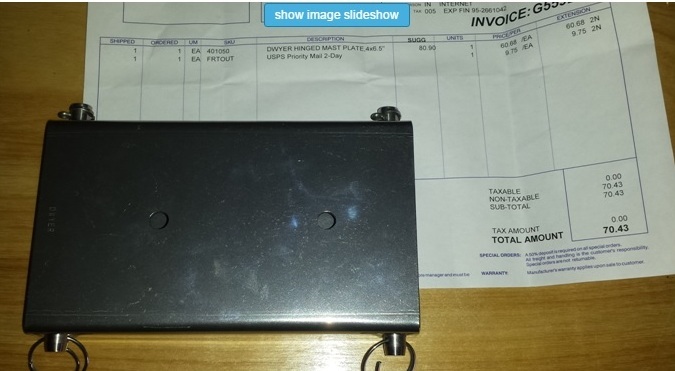 Here is a photo and below a blue print I made from the defective part. Luckily I can flip this one and redrill the roll pin hole. I got the lathe work done on my new spreader mounts and caps but haven't done the drilling and tapping yet. One question I have on this is should the outer cap clamp tight on the shroud or should it allow the shroud to slip through? The old ones look like they were set up for the shroud to slip through as it looks like it's a 1/4" diameter groove for the 3/16" diameter shroud wire to go through. I can't say I haven't thought about it. LoL. Too much life getting in the way right now, I didn't even make it to the Strictly Sail Pacific boat show in San Francisco last weekend. Today it was 89° and getting hotter by the week. Soon will be too hot to work on the boat. The good news is, we had great winter storms this year so the lakes are full. There's even some snow left in the high country ( We keep it 2 hours up the freeway where it belongs!) My kids have jokingly decided that Grand Finale is Latin for "boat that will never float!". It will happen soon enough. It's a red letter day! Just raised the mast for the first time! It's been 11!! years since I brought her home from Simi Valley. In Isla Mujeres for a week. Sure beats the Grand Canyon. Wish I had my boat here to sail! Warm weather, constant breeze and amazing turquoise water! 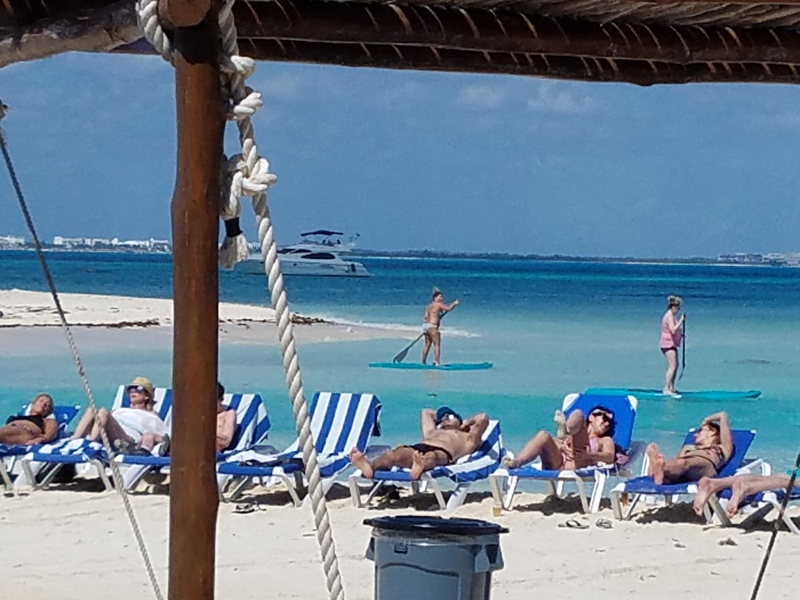 Postscript April 23, 2018: Actually thinking trailering to Key West then sail to Cuba and then on over to Isla Mujeres, The charts say 336 nautical miles from Key West to Isla Mujeres. That is the new plan for next years vacation! In Dolphin news....I've finished adding the Catalina 25 outhaul kit to my boom but am not too happy about the 2 or 3 inches off the foot of the main it'll cause me to give up in going to a loose footed main.